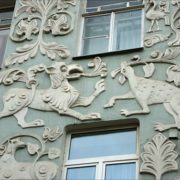 Art Nouveau house bas-reliefs of fantastic animals is one of the most interesting in the facade decoration buildings in Moscow. 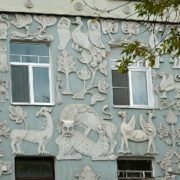 The locals call located on Chistoprudny Boulevard, a former apartment house of the Church of the Holy Trinity very simply – house with animals. 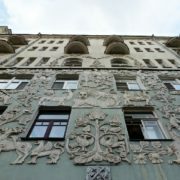 Performed in the style of the Art Nouveau building of the early 20th century gained its fame thanks to the unique terracotta bas-reliefs. 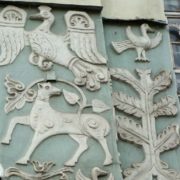 The bas-reliefs of fantastic animals, birds and plants adorn the walls of the the third and fourth floors. 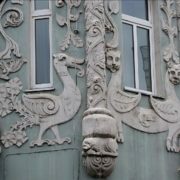 They look fantastic – owls and ducks, griffins, dragons, lions, chimeras, unusual plants and flowers, and some unidentified creatures. 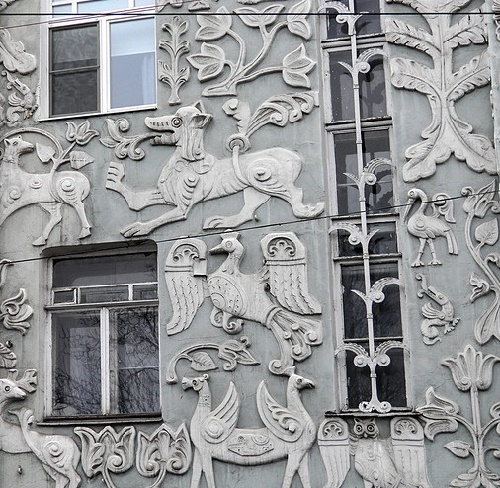 Creating the bas-reliefs the artistic team “Murava” used sketches of artist Sergei Vashkov. Vashkov was a pupil of a famous Russian painter Vasnetsov and one of the recognized masters of Moscow Art Nouveau. Besides, he was a specialist in the field of religious art. 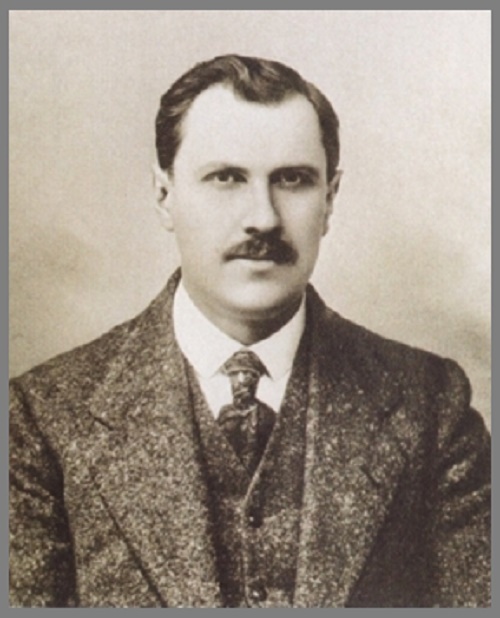 Interestingly, after the construction of the house, Sergei Vashkov settled in it. 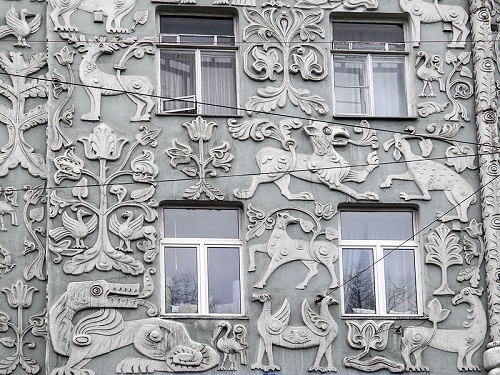 Sergei Vashkov was fascinated by medieval bas-reliefs on the walls of a cathedral in the city of Vladimir. 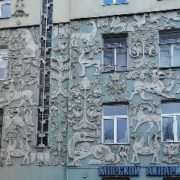 The facade of the cathedral decorated 600 reliefs depicting saints, as well as real and mythical animals. 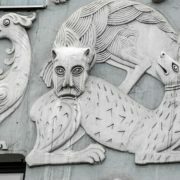 They also became the prototype of the mythical creatures, settled on the facades of the apartment building. But the artist did not simply copy these images, he reinterpreted and “adapted” the architecture of the early 20th century. 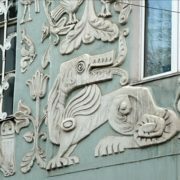 Thus, the creatures became much larger, and their drawing became more grotesque and ironic, that was typical of Art Nouveau that time. 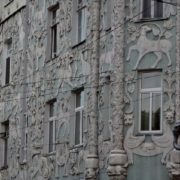 The house was built in 1908-1909 by the architect Lev Kravetsky and civil engineer Peter Mikini. And the church gave money for the construction of the building. 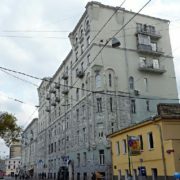 So, it was a tenement house of the Church of the Trinity at Pokrovsky Gates. In fact, the house was planned for accommodation of needy parishioners, and partly, it aimed hiring for profit. Originally erected on the original project house was a 4-story, but after World War II, in 1945, it was rebuilt by architect B.L. Topaz and gained height of 6-7 floors. 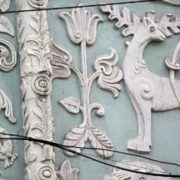 Unfortunately, the constructors had to destroy the top (4th) row of bas-reliefs. Anyway, the rest of mythical bestiary preserved well. The most recent changes in the appearance of the house took place in the 2000s. 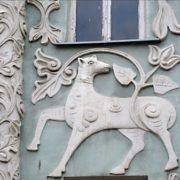 As a result, the house acquired the current pale blue-green color, and the bas-reliefs became white. 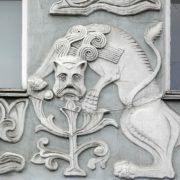 Today, the building has the status of an object of cultural heritage of regional significance. 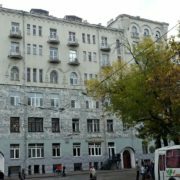 By the way, to see how the beasts looked before reconstruction is possible in a great Soviet film “Foundling” (1939) – adventures of Moscow girl Natasha began just with the house entrance. 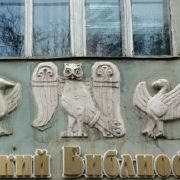 But to see how the building looks now – come on Chistye Prudy – Chistoprudniy Boulevard, Building 14.